Devon County Council's leader has vowed to protect the "old, vulnerable and the very young" after cuts were announced in government grant funding. Conservative John Hart was speaking after Communities Secretary Eric Pickles said the council would lose £10m next year, a cut of 1.77%. Unitary authorities Plymouth lost £10.5m, a cut of 4.35% and Torbay lost £4.8m, a cut of 3.44%. 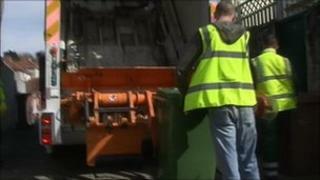 Devon County Council has already announced cuts of £5m. Mr Hart said: "The old, vulnerable and the very young are the people, the very front line services, that we have got to protect. "We have got to protect them at all cost and we will be looking at ways of doing it." Plymouth City Council has already announced plans to axe 500 posts and find savings through changing the way it works. Exeter City Council and North Devon District Council face losing £1.3m, or 8% of their funding. South Hams District Council appears to be losing the smallest amount among the districts, 5% of its government funding or £600,000. Margaret Garton, chairman of West Devon Borough Council's Strategies and Resources Committee, said: "The reduced grant allocated to us will be a challenge for the council but we will endeavour to produce a responsible budget that meets the needs of our community." John Tucker, leader of South Hams District Council, said: "We are currently looking at the finer details of the announcement. "However, we are determined to freeze any increase in council tax for our residents in the next financial year and maintain our front line services." Does every English city need a mayor? Who has time to change the world?